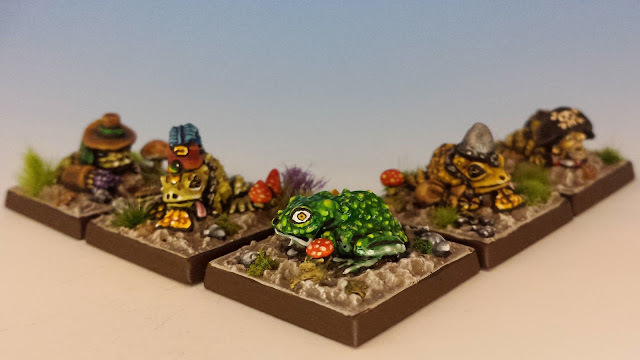 Here's the full set of Citadel's toad miniatures for Talisman (1st/2nd edition). 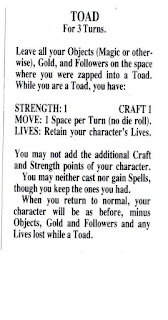 Of all the cliches that populate Talisman, my favourite is being zapped into a toad. Getting turned into an amphibian is an an old saw that starts with the fairy tale of the Frog Prince and reaches into every story where magic plays a role, from The Lord of the Rings to Monty Python and the Holy Grail ("Well, I got better.") But as far as I know, Talisman is the only board game where getting toadifacted is a regular and oddly satisfying occurrence. The pick of the litter, at least as far as I'm concerned, is the Pirate Toad. It's not just because he's an especially grotesque figure, but because he represents the only occasion where I've made money on my miniature collecting habit/obsession. About two years ago, for reasons that are still not clear to me, I set out to collect and paint the entire range of Citadel's Talisman miniatures. I thought I already had a good start, having painted a couple dozen of the most common minis. Little did I fathom the magnitude of my self-appointed task. 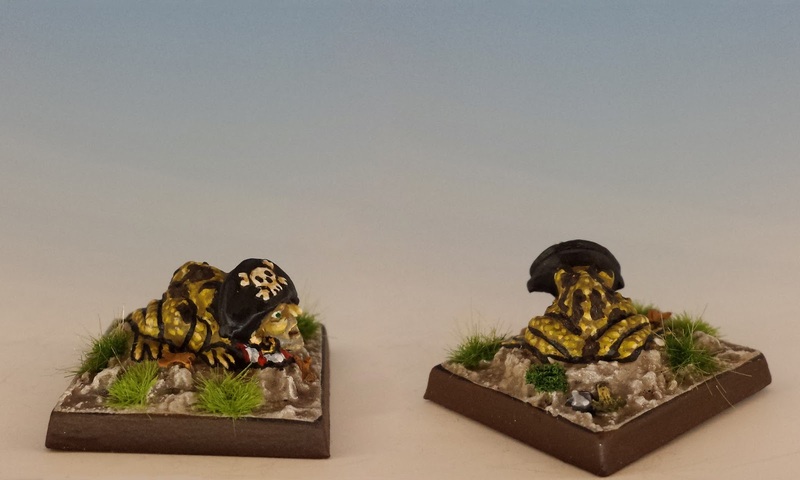 Did you realize that there are 70 Citadel Talisman miniatures, including expansions, alternates and amphibians? I sure didn't. That's because I'm A Idiot. 70 is a lot of lead. A lot of very expensive lead. Well, after blowing a fortune, I had finally gathered 69 of the miniatures. Only one lost sheep eluded me: the Pirate Toad. He couldn't be got for love or money. For painful months eBay was quiet. The Oldhammer Forum was silent. I wandered through the internet, looking for a Pirate Toad, but no Pirate Toad was to be found. Like every loony collector, I became convinced that this one last piece would never be found. And then the PT surfaced on an eBay auction! There was only one catch. He was included in the collection of some other poor madman who had collected the entire range of Talisman miniatures. He was bundled with 71 of Talisman miniatures, as well as a complete set of the game and most of the expansions. It was a massive and very valuable lot. I was terrified this auction could easily run into the hundreds or thousands of dollars. But, one of the odder laws of eBay is that large collections often sell for a fraction of their true value -- even though individual Talisman minis often sell for between $20-40, this whole auction eventually topped out at only $200. That is to say, it sold to me for $200. After unwrapping the Pirate Toad and laying him on my shoulders, I was left with only one dilemma. What to do with the extra 6 dozen Talisman miniatures that accidentally came with him? I hate selling stuff on eBay, especially piecemeal. So I asked around at the Oldhammer foum about selling in bulk and made some discrete inquiries of ads in the back of certain magazines ("turn your lead into gold"). I finally settled on Noble Knight Games. To my amazement, they offered me over $400 for the minis. (Not only did they give me a fair price, but they were a pleasure to deal with -- so I highly recommend them if you too are selling a bulk lot). I got to keep my toad, plus a nearly mint version of Talisman 2nd edition, Talisman Expansion, Talisman Adventure, Talisman Dungeon and Timescape. Thanks for staying with me for the whole, long story. 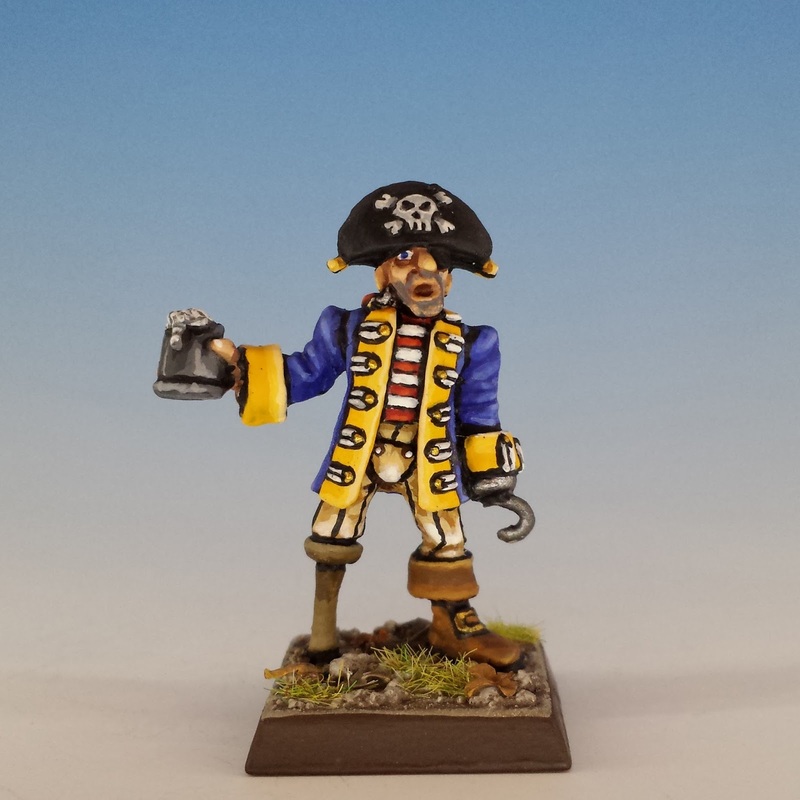 When a man finds his lost Pirate Toad, he calleth together his friends and neighbours, saying unto them, Rejoice with me; for I have found my Pirate Toad which was lost. I love a happy story. Lovely to see you come ahead with ebay. I really dig the pirate. Great yellow hues, and great shade of.....white/tan on his pants. Black lining is impeccable. While i've been satisfied with my 4E plastic minis, you've now got me wanting lead ones (which i won't paint, as i haven't an artistic bone in my body and my hands shake too badly to do such high-detail work). Nonetheless... it'd be nice to have them. 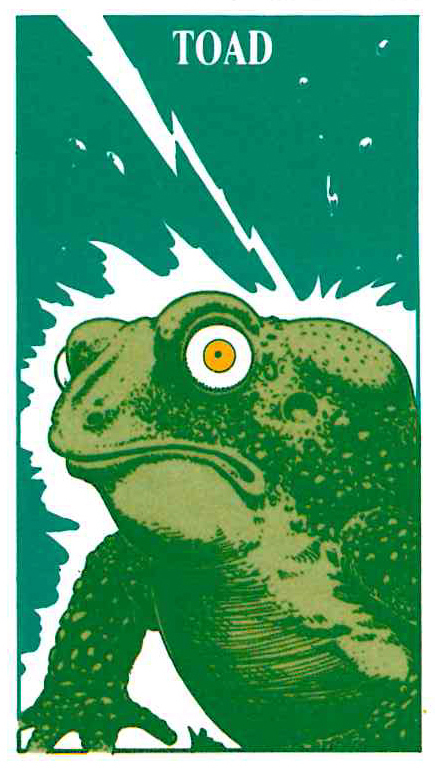 There's a card to zap an opponent into a frog in blood bowl - I have the old toad that came with a brettonian sorceress special character I've been meaning to get painted up. Of course! 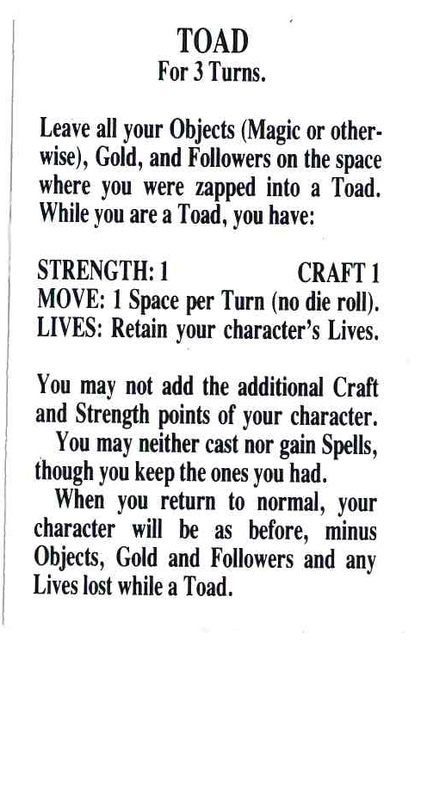 I should have guessed Blood Bowl would also have some toadification. Congratulations on completing the set! Glad to hear that you have completed your Talisman collection. There always seems to be one obsession that grips us, doesn't there? Great looking toads. I never thought I'd say that!